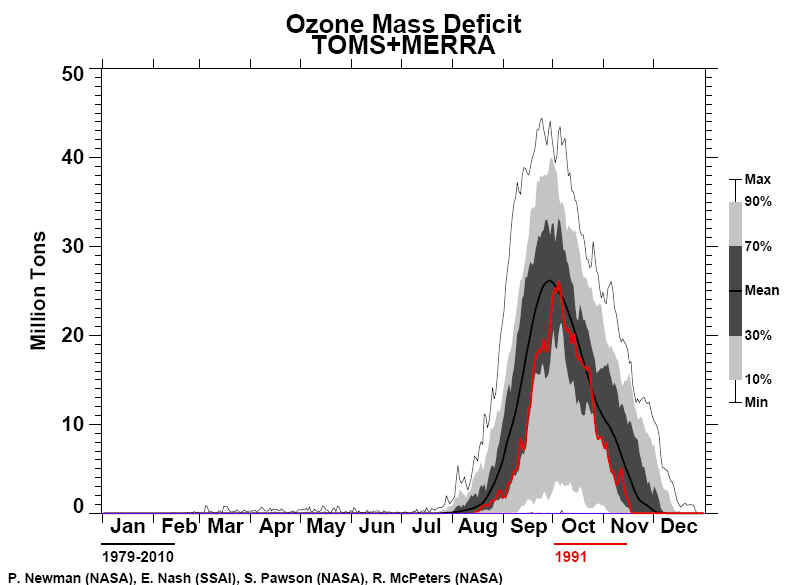 The 1991 Antarctic springtime ozone decline, as measured by the Total Ozone Mapping Spectrometer (TOMS), was similar to those of earlier deep ozone hole years, 1987, 1989, and 1990. 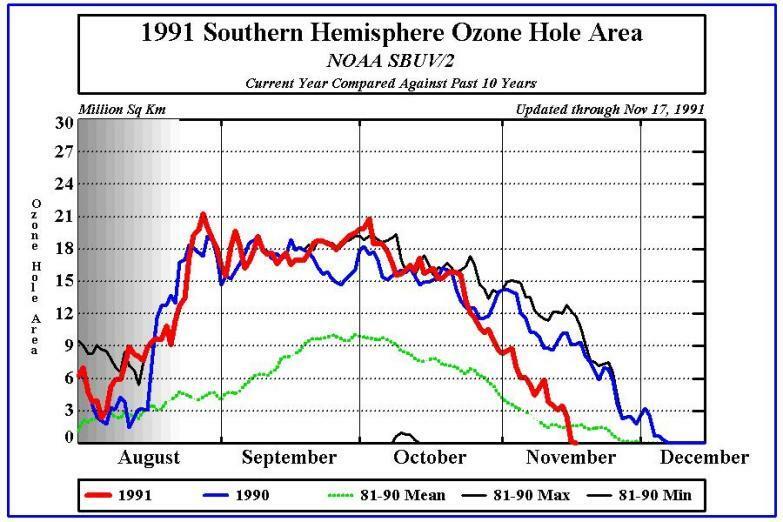 The minimum total ozone value was recorded on October 5, 1991 at 108 Dobson units near the South Pole. This was 8 DU lower than in any of the earlier years. 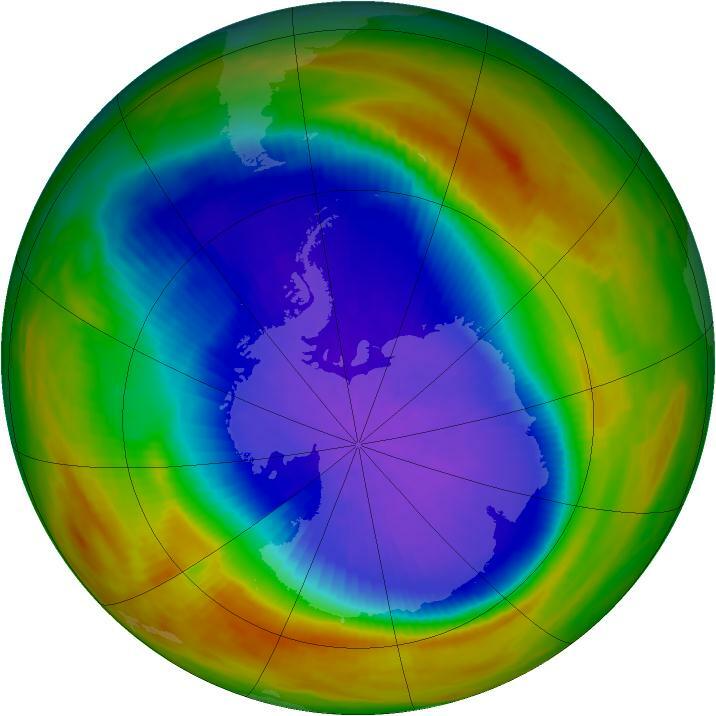 Four of the last five years have exhibited an extensive, deep ozone hole. The area of the hole was about the same as in 1987, 1989, and 1990. 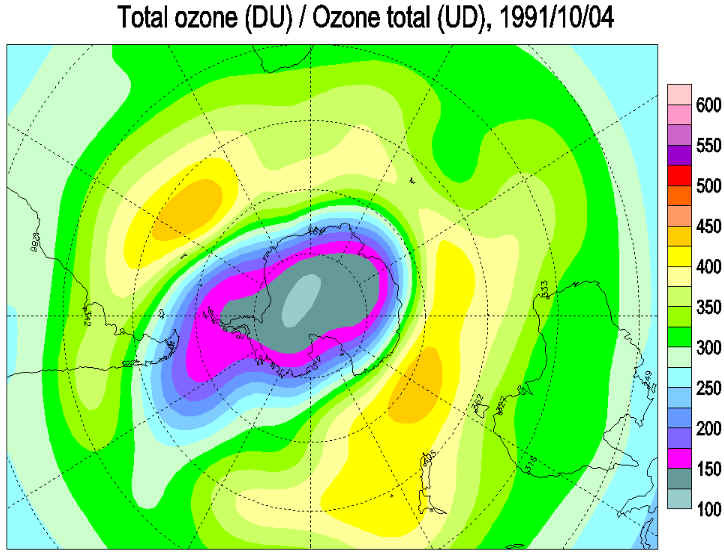 The recovery of the low total ozone values occurred in mid‐November as the polar vortex broke up. The National Aeronautics and Space Administration reported yesterday that a satellite passing over Antarctica had measured the lowest stratospheric ozone level on record, an ominous indication of potential global health risks. Dolores Beasley, a spokeswoman for the agency's Goddard Space Flight Center at Greenbelt, Md., said the measurement was made Sunday by the total ozone mapping spectrometer, or TOMS, an instrument aboard the Nimbus-7 satellite. Dr. Arlin Krueger, a Goddard scientist, said the ozone level in the Antarctic stratosphere was measured that day as 110 Dobson units. Dobson units measure the atmosphere's ability to absorb and block certain wavelengths of light coming from the Sun, notably ultraviolet radiation. In normal times, the atmosphere above Antarctica measures about 500 Dobson units, but values far below this have been recorded in recent years when seasonal "ozone holes" have developed over the southern continent. Public-health experts fear that the increasing intensity of ultraviolet radiation that now penetrates the atmosphere may greatly increase the incidence of skin cancer and cataracts, and could significantly diminish global crops and the marine food chain. 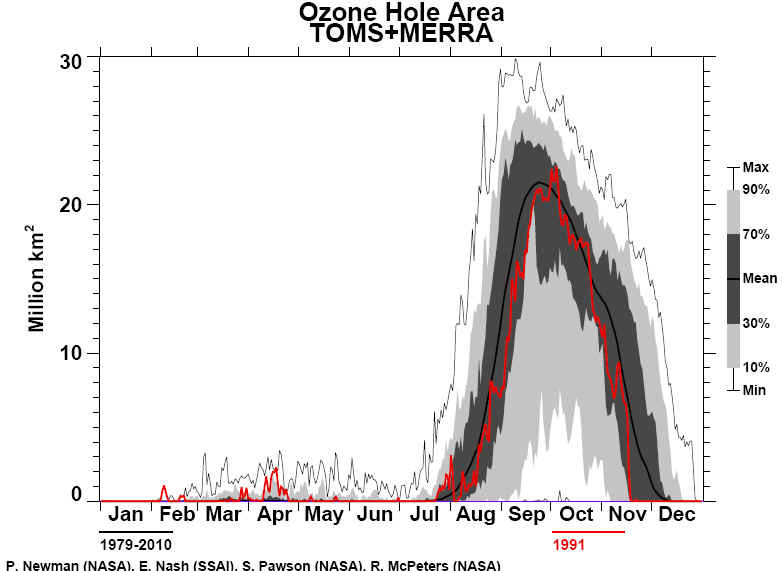 "The minimum ozone on Oct. 6, 1991, is the lowest we have ever seen with the TOMS instrument in its 13-year record of data," Dr. Krueger said. "Although the data are preliminary, we expect that the final results will confirm this conclusion." Space-agency scientists cautioned that the record low for a single day did not in itself imply that the Antarctic ozone hole would be more extensive and severe during the entire season than in any previous year, but there are other indications that this year's hole will be one of the worst seen so far. 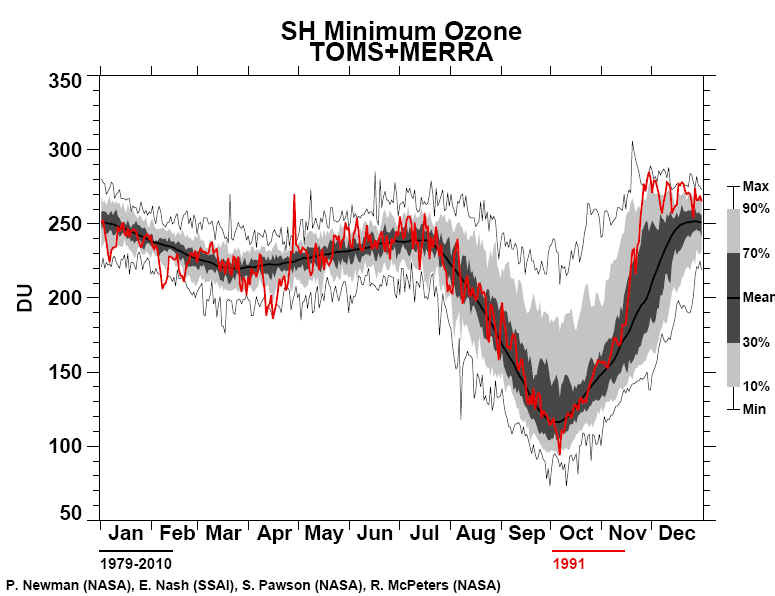 This is the third consecutive year that severe ozone depletion has been observed over Antarctica. Evidence has been rapidly accumulating in the last few years that the main cause of stratospheric ozone depletion has been the presence of chlorofluorocarbon chemicals released into the atmosphere by human activity. These substances are widely used as refrigerants, solvents and foaming agents in insulating plastics. Because they are highly resistant to chemical attack, chlorofluorocarbons remain in the atmosphere for many years, eventually drifting up into the stratosphere where they are broken down by ultraviolet radiation. The chlorine and oxygen compounds yielded by this breakdown then destroy the natural stratospheric ozone. Although the world's major producers and users of chlorofluorocarbons agreed last year to phase out their use by the end of the century, some scientists and conservationists argue that ozone depletion has reached a crisis, and that a more urgent global ban against these chemicals is essential.